People ask me: Why do you like beads? That’s so unusual for a guy like you. When history becomes tangible you find yourself most likely on an art market. Nowhere else I’ve been before I felt the past and the present of a culture so close. Literally lying in the palm of my hand. Beads are past. Beads are present. Beads are materialized forms of globalization; Telling tales of beauty and oppression, of craftsmanship and unspeakable horror. Beads are a West African epitome of cultural intertwinedness. What you can find on markets such as the Thursday bead market in Koforidua is an incredible array of beads. The variety is so large that the prices will range from 1 Cedi for a string of waist beads to $ 3500 for a necklace of old Chevron beads. Organized traders will have their stalls right next to people selling beads from dusty piles. The perfect place to be for every treasure hunter. Handful of old and new trade beads from various materials can be found here. Glas, stone, clay, bone, teeth, ivory, wood, seeds and many more. Within this array of beads there is one outstanding one. One that shadows all other beads with its spiritual presence and beauty: the chevron bead. The chevron bead is a multi-layer glass bead used for trade and ceremonial purposes. Chevron beads have been made in Italy since around 1496. The 7-layer Chevron trade beads date back to between 1480 and 1580. Made on the glass makers island of Murano in Venice they were introduced to the African continent by dutch merchants around the 16th century. After the 7-layer beads, 5-layer beads were made. The early 1600s saw the introduction of the 4-layer and the 6-layer Chevron trade beads whose outer layer was either green or black. African traders valued the 6-layer and the 7-layer Chevron trade beads more than the others because of the complex manufacturing process. The market value of a Chevron bead depends on the number of layers, its age and the symmetry of the star pattern. It is hard to determine the age, so the condition of the bead and whether the bevel is rounded or faceted is used to make the determination. The older the beads, the more they will fetch. 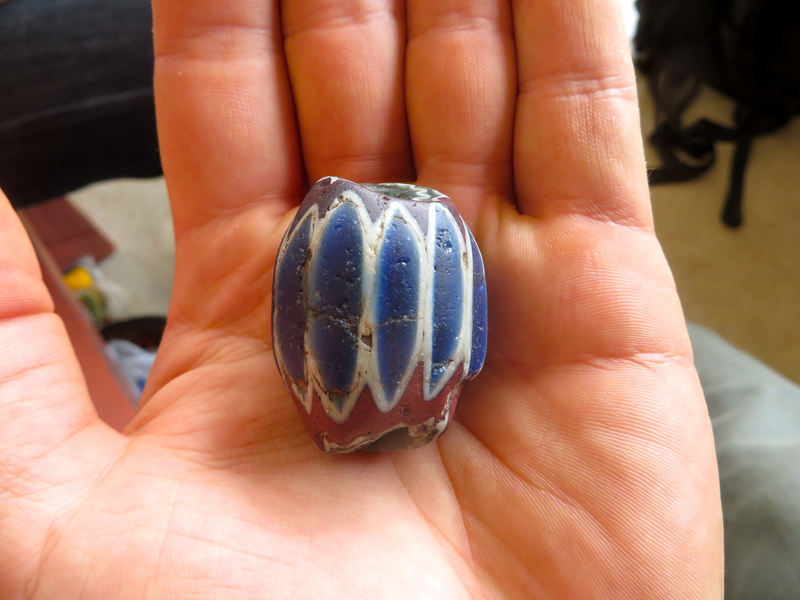 Chevron trade beads were made for trade by Europeans in Africa. They were exchanged for different services: palm oil, ivory, gold, and in the early trade even for slaves. Though this trade ended as soon as weapons and powder where available, the chevron is still strongly associated with the Atlantic slave trade. Africans placed a lot of value on them since they where a display of their trade relations with the Europeans and couldn’t be produced by themselves. Used for decoration, as a measure of value and as currency they spread all over the Sub Saharan continent and as far as India. Chevron beads were traditionally made up of red, blue and white layers. A smaller number of chevron beads were produced in green, black and yellow.Chevrons were ‘drawn beads’, made from glass ‘canes’ created in specifically constructed star moulds. Typically, four to seven layers of different colored glass was added to the mould, conforming to the star mould. Metal plates were affixed to the hot glass which was then ‘drawn’ into a long rod called ‘canes’, by pulling from either in opposite directions. A bubble which had been blown into the centre of the original molten ball of glass formed the hole in the cane and beads perforation. The diameter of the cane or beads was determined by how thin the glass was drawn out. The cooled cane was cut into bead sizes, revealing a star pattern at either cut section. Each end was then ground or faceted to enhance and display the star chevron pattern. Star beads with flat ends are more correctly known as ‘Rosetta star beads’. The first known Chevrons typically had seven layers and six facets. Over time and through use, an inner layer would sometimes wear away. By the beginning of the 20th century, four and six layer chevron beads appeared on various bead sample cards. New Chevron beads were made in India during the 1980s and brought on the African market. Today most of the new beads are coming from China. They can be easily identified by their symmetric layers and their ‘cold’ and ‘clean’ appearance. To feel the presence of a 400 year old Chevron is a magical moment. Imagine the stories it could tell. Where it has been. How it got here. How many hands it has touched and how many lives have been exchanged for it. Beads are an essential piece of local history. Forgotten by the majority of people who look into the future, into a world that keeps spinning faster and faster. Beads are like an old whispering man. Bodies of history, culture, past and future. To hear their stories you need to take your time. Listen carefully and eventually you will connect the dots. Thats why I like beads. The chevron also inspired writers in Ghana. This is one shows the power of the history of this bead. Don’t even talk of it. Then what on earth is chevron? And not at all…a bead. Seven whole lifes for one bead? And what kind of trade was that? For the lives of our kinsmen? So what if it was one and not seven? One soul for a shiny piece of bead? This sounds like utter foolishness!